Free Inter with Entrance exams Free Coaching admissions: Tswreis online application form for Inter with Integrated coaching admissions 2019, Tswreis Inter with Integrated coaching admissions test 2019, TSWREIS IIT, COE, Magnet Colleges admission test 2019, TS Social Welfare Entrance Test 2019, TSWREIS Entrance Test 2019 for Join into Inter with IIT-JEE/EAMCET/NEET/CA/CPT Coaching TSWREIS Entrance Test for Join Inter with IIT-JEE/EAMCET/NEET/CA/CPT Coaching 2019-2020: Telangana Social Welfare Residential Educational Institutions Society(TSWREIS) has issued an entrance test 2017 notification for Admission into 1st Year Inter With Integrated Coaching For IIT-JEE / EAMCET/CA/CPT in the institutions of Society. 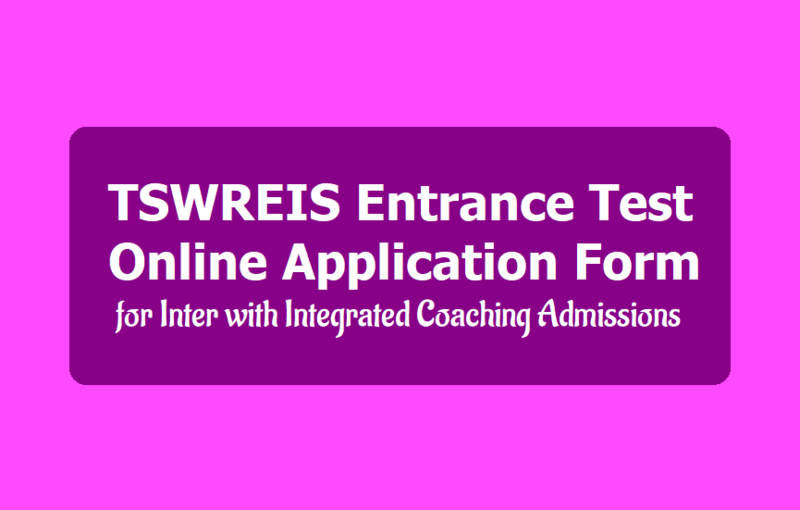 The TSWREI Society invites applications from eligible and qualified Boys and Girls for appearing entrance test for admissions into 1st year intermediate MPC (with IIT-JEE/EAMCET coaching) and BPC (with NEET Coaching) and MEC/CEC (with CA/CPT Coaching) with English as the medium of instruction for the academic year 2019-2020. 1. The students who are appearing for SSC Public Examination in March -2019 and who secured Overall Grade and above (equal to 50%) in 10th class quarterly examinations i.e., SA-I (September/October, 2019) are eligible to apply. 4. The age of the students shall not exceed 17 years as on 31.08.2019 and in case of students studying in Social Welfare Residential Schools and Social Welfare Hostels a relaxation of 1 year will be given. 5. The students should produce Bonafide, Caste and Income certificates certified by the M.R.O. at the time of admission, then only admission will be confirmed. can attend their work without anybody’s help based on the certificate issued by the Medical Board. 1. The applicant can submit his / her application through ONLINE visiting website www.tswreis.cgg.gov.in. 2. There is no registration fee for submission of application through ONLINE from any Internet centre in the State. 3. Before filling the application through online the candidates have to read the information already uploaded in the website www.tswreis.cgg.gov.in. 4. Please upload the 50 kb photo and 30 kb signature of the student. 2. Only the meritorious students from the 1st screening test will be permitted to attempt 2nd level screening test. 3. The list of eligible candidates for 2nci screening test can be obtained from the website. 4. The test will be based on the knowledge from class VIII to SSC in English / Mathematics/Biology and Physical Science subjects. 5. The entrance test question paper will be in bilingual (i.e., in English and Telugu Media). Applicants can select any language as medium for writing the Test. 1. Selections will be made on merit basis subject to fulfillment of 'Eligibility' and 'Reservation'. 3. In 8 Magnet Colleges those candidates will be admitted who have passed SSC Public Examination 2015 in first attempt with 60% marks in aggregate and 50% marks in English. 4. The Students will be allotted admissions into TSWR (IIT-LTCD) Jr.College, Gowlidoddi then to TSWR COE Karimnagar and then to Magnet schools based on their merit in the entrance test. In TSWR (IIT-LTCD) Jr.College, Gowlidoddi, TSWR COE Karimnagar and 8 Magnet Colleges English will be the Medium of Instruction. Last date for submission of applications through ONLINE is : 23.01.2019. District; Mandal; Village / Municipality; House / Door Number;Street Name; PIN Code; Mobile Number; Landline No. (With STD Code); eMail ID. (b) If you are studying other than TSWR School; School Name; District.